Firefighter Aiden Hawk has found his calling—giving back to the community that helped raise him—but deep down he longs for more. 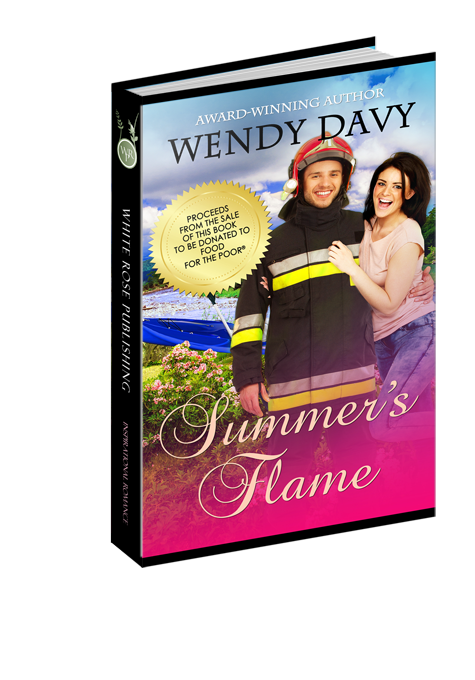 When Summer Cassel comes into his life hope sparks, and he dares to dream of a family to call his own, but each time he nears her, his nerves kick in and a shy streak takes hold. Will she be bound by fear or released by faith? For more information on this project for charity, and to find out more about Food for the Poor, visit the Summer's Flame web site. If you would like to donate to Food for the Poor®, more than just the proceeds from this purchase, please add your donation to your cart here: DONATE 100% of the monies we receive through the DONATE link will be sent to Food for the Poor® along with all proceeds from Summer's Flame purchases. This order is a 10-pack bundle. Order quantity 1 and you will receive 10 books. Order quantity 2 and you will receive 20 books, etc.